It’s been over two years since I collaborated with archaeologist Keir Strickland to undertake a research trip to the abandoned island of Swona, in August 2014. 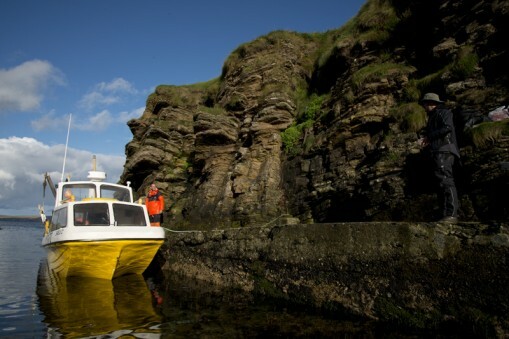 Swona is just over a mile long and half a mile wide and lies in the tidal stream of the Pentland Firth off the north coast of Scotland. The island was inhabited until 1974, when the last two people left. Only a herd of feral cattle remain. 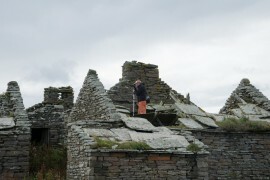 The abandoned dwellings are now left open to the elements. 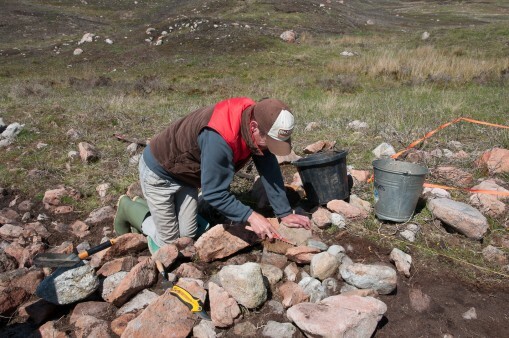 I met Keir in 2013 when I was Artist in Residence at a longhouse excavation organised by Timespan Museum in the Highlands. During that project Keir muted the idea of visiting Swona together, exploring how art and archaeology could unfold the island’s history. In 2014 we were awarded a New Collaborations Bursary from a-n to fund an initial research trip. I travelled up to Orkney for a week, but due to high winds we could only make the crossing to Swona on our chartered boat on two of the days towards the end of my stay. This gave plenty of time for research at the Ornkey Archive, where I listened an audio interview with a woman who lived on the island for many years as the school teacher. The time waiting on the mainland added to the anticipation and made the site even more elusive and unknown. I had time to consider how I might document the island and which kit to transport across. In previous work I had almost exclusively worked with medium format film photography. However, the slow speed and bulkiness of the kit led me to take over only one camera, a high end digital SLR, with a view to making documentary stills and a moving image piece. The previous post ‘Landing on the moon’ describes my experiences of our time on the island. I filmed a lot of footage on the island and returned to London and back into a busy university teaching post. I’m afraid I lost the momentum on this project, and the video files remained squirrelled away on a hard drive. Last year I had an extended period of maternity leave. It is only this year I’ve had the space to look at the footage again. I had two deadlines in which to get the film ready by (I find I work best with some kind of public output timescale). The first was a research symposium, ‘Moving Stills’ organised by the University of West England Photography Research Group. I presented a paper: ‘From stilled time to time-based: reflections on photographers’ use of moving image as an extension of their craft’ and screened a clip of my Swona film. I got some positive feedback at the event. 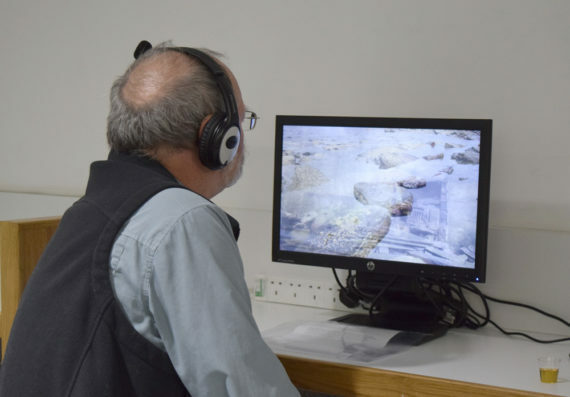 I went on to screen the whole film at CHAT 2016 (an annual conference in Contemporary and Historical Archaeological Theory) at Orkney Theatre in Kirkwall. My film was installed in the foyer for the entire three-day conference alongside other visual art responses to the conference theme. On Swona I used video to document the abandoned houses and their position against the surrounding sea. 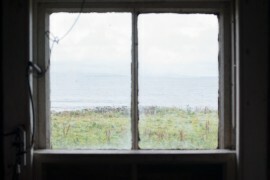 The resulting work is entitled ‘Flood’ and explores specifics of the story of Swona from a poetic viewpoint: the hurried abandonment, the intimate size of the island, the proximity to the restless sea, and of nature taking over the domestic spaces. The title Flood refers to my visualisation of the house being slowly submerged by the sea. Flood can also mean the the rise or flowing in of the tide. The act of flooding fills and cleanses the voids of the lonely homes, bringing new life. I use multiple exposure techniques very similar to my previous series ‘Realm’. I wanted to see how the double exposure process would work with moving image. I filmed several interiors and seascapes from the island and over the past few months I’ve been slowly piecing the footage together. At times I’ve printed film stills to work with the sequencing. I’ve called this blog post ‘Landing on the moon’, as that was kind of how it felt walking around the island of Swona. Five of us spent two days there at the end of August (here’s a brief video of ‘the team’ on route to Swona). We spent the entire time cocooned in full waterproofs, with multiple layers underneath to insulate from the cold wind. Swona felt quite desolate, there were no trees and no people have lived there since 1974. It might seem like an exaggeration to compare it to a moon landing, but wrapped in our all weather gear, movement was slow and trampling over this quiet landscape, I felt like an intruder, out of place. 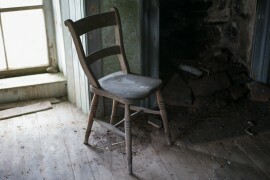 This feeling of intrusion felt especially acute inside the houses, which had been long since abandoned. Rose Cottage was the last home to be abandoned, now 40 years ago. It was the home of the Rosie family, with twin brothers Arthur and James and sister Violet living there until their old age. 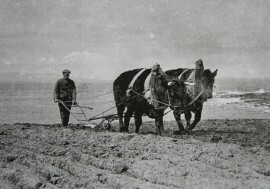 Arthur had to leave the island due to ill health in 1973 and his siblings left the year after. It appears they left in a hurry, with Violet possibly considering returning, as Rose Cottage has been left as if the family will be back. But they never did return. 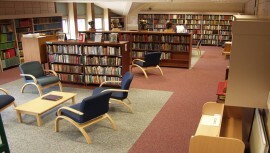 Books, papers, cutlery, tins and clothing are to be found in the main downstairs room. The two bedrooms upstairs still have the beds made ready to be slept in and boxes of personal items in suitcases. Rose Cottage was the first of the houses Keir and I explored together. 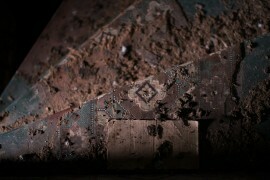 I was interested to see how our approach (art/archaeology) might differ on encountering the abandoned interiors. However, it was remarkably similar: we both tentatively explored Rose Cottage, photographing as we went, speaking occasionally to remark over different items. 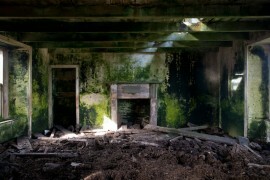 The soft light coming through the windows illuminated the decay almost beautifully. 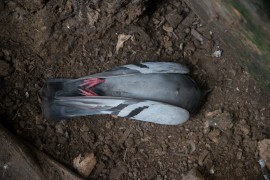 We were careful to leave everything as we found it, making sure we securely roped up the door, to stop the cows wandering in (as one had done a few winters back, and died in the other half of Rose Cottage, which is now boarded up). But even so, our carefulness and respectfulness of the past still felt intrusive. Previous abandoned houses I have photographed elsewhere didn’t have that tangible sense of it being a family home full of secrets and treasures. Keir will write a second guest post soon for this blog and will be able to share his thoughts. But I wonder if through the eyes of an archaeologist this dusty evidence of past lives was seen as artefacts or ‘finds’, or whether it was overwhelmingly somebody’s private home? We spent quite a bit of time in Rose Cottage, as initially this seemed to have the most material to consider and respond to. 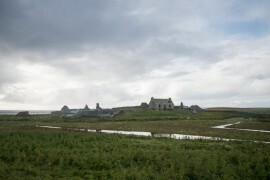 There are about six other houses on the island, with numerous outhouses, but these were all abandoned over 60 or 70 years before (with the exception of a very tidy house near the harbour, which is kept inhabitable for regular visiting bird ringers and the occasional ship wrecked sailor). From initial sharing of our photographs of Rose Cottage, Keir’s and my photographs were remarkably similar. One of Keir’s questions about our images of Rose Cottage is how much they might actually say about the wider picture of the abandonment of Swona (something we are attempting to research through this project). As an artist I didn’t want to merely repeat what many other explorers of Swona have done before me and photograph only the dereliction (this has already been covered extensively in John Findlay’s book A Photographic Portrait of Swona). 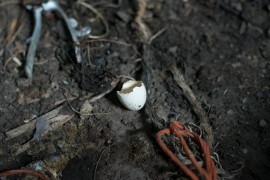 I was there to begin to make new work about the specific abandonment of Swona. Something that really struck me whilst researching and actually on the island was its remoteness and the sense of the smallness of the landmass against the surrounding sea. The sea is key to understanding how people survived (including the resourceful use of the shipwreck cargos as described in an early post). The remoteness because of the sea is the main reason why people eventually left this island and other similar islands nearby, for example Fara and Copinsay. Any work that I make should reflect this barrier, the sea. 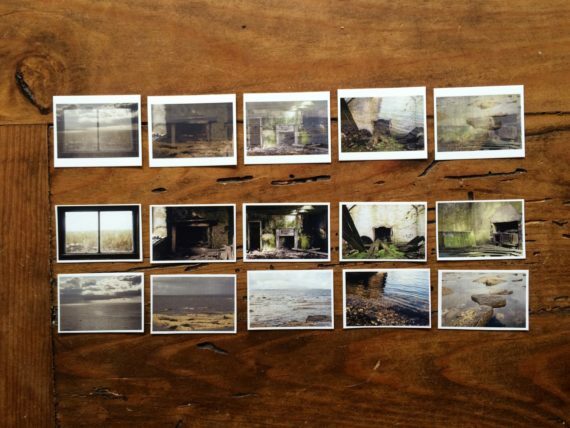 Initial ideas are to combine the photographs I took in Rose Cottage with field recordings of the house, the wind and the sea. My assistant and sound man Ralph was using a Zoom H4n and external stereo microphone rig wherever we went. 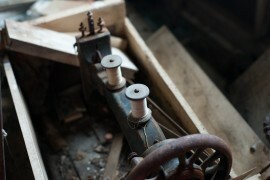 I will post a work in progress on this blog soon with a sound and image piece. 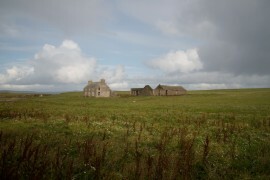 Elsewhere on the island I found the old school house and captured ‘moving photographs’. I set the camera up on a tripod and filmed each interior for five minutes. The view was fixed, but as wind blew through the open window, overgrown vegetation moved, rain dripped slowly through the roof eaves, light played on the walls. 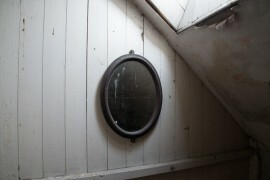 Ralph recorded synchronised stereo in each location, as I filmed in many of the abandoned structures. 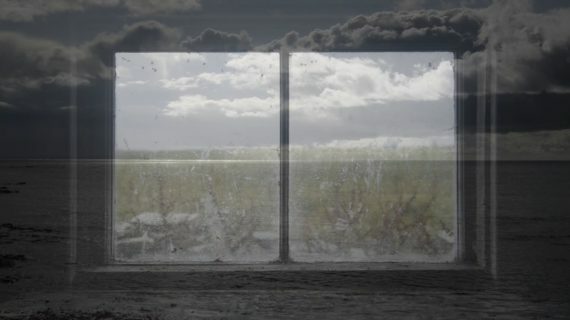 I also filmed sequences of the sea, which I plan to merge with the interiors, so the sea consumes the house. I will post a work in progress soon of this too. 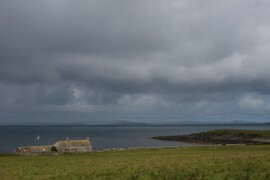 Much of the two days on Swona was spent walking, exploring and quietly thinking about the island. Keir will share his ideas here soon, but with only two days he didn’t have enough time to carry out a proper survey or consider an excavation. Could this be something his wishes to return to do? We also had two other archaeological specialists with us from the Survey and Recording department of RCAHMS (Royal Commission on the Ancient and Historical Monuments of Scotland). 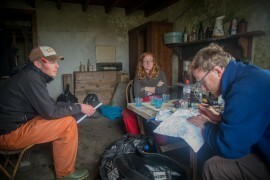 George and Alison worked tirelessly for the whole two days (even staying overnight on the Thursday night to get more hours on the island) mapping the island. 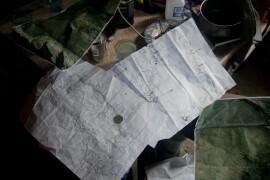 They referred to existing ordinance survey maps and updated measurements using surveying equipment. This updated survey will hopefully be incorporated into our wider collaborative research project. Today we made it across to Swona in a cute yellow boat called Sheila C, captained by two lovely chaps both called Magnus! 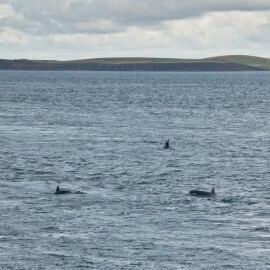 The crossing from Burray Pier to The Haven at Swona took about 30 minutes and was really good fun. The little boat had two engines and went at quite a speed. We were able to get off easily at The Haven stone pier at Swona (we had been worried about having to wade in with rolled up trousers, but it was all very civilised). Our party included me and my assistant and sound man Ralph (also my husband! ), and three archaeologists Keir, George and Alison. The trip today was a success. The island was wonderful to explore. I will write up a more detailed post next week after our second visit tomorrow, with more time to reflect on this special island. Yesterday the sea was still too rough for us to make a crossing to Swona. Both mornings we had psyched ourselves up – packed the kit, food supplies, dressed in warm layers of clothing and head-to-toe waterproofs – and arrived at the pier, only to receive the message of the cancelled crossing. Yesterday morning felt a bit like Groundhog Day. As the adrenaline seeped away as I looked out to sea, I started to get excited about a day in the warm archive room at Orkney Library in Kirkwall. Swona will have to wait until Thursday now, then surely we WILL get there! So yesterday was on to plan B, to check out any archive material to supplement all of the amazing information Cyril Annal provided on Monday. Orkney Archive room is a cosy place, which must not have changed in decades. 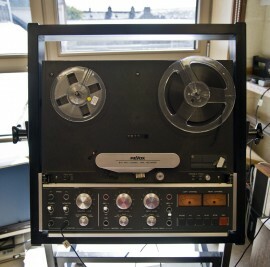 I listened to some Orkney Sound Archives on an old fashioned reel to reel machine. They are yet to digitise quite a lot of their archive. I listened to three sections of an interview with the last school teacher who was employed to work and stay on Swona in 1924. Jessie Aitken was interviewed in 1992 and it was worth a listen. She was 18 when she started her post and lived in the school house on her own sleeping in a box bed, with only pesky mice for company. Aitken described the simplicity of island life on Swona, but also the sense of isolation and loneliness she felt. She stayed for a couple of years, the main reason she went back to stay on the mainland was for health reasons and lack of food choices! Aitken gave a flavour of the lifestyle at that time and I enjoyed trying to decipher the dialect. I worked out that to remember is to mind something, a church is a kirk and peedie is little or mini. She spoke a lot about the Rosie family and other families on the island. Her parting comments were that the people of Swona were ‘tidy folk, nice folk’. 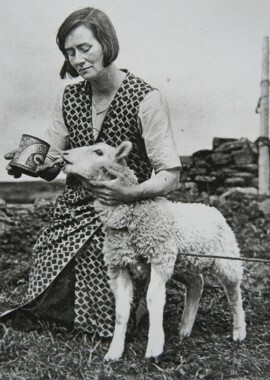 Just as with listening to Cyril on Monday, her stories will bring the island alive for me. I also looked through the photography archive, and there was very little on Swona. Most of the photographs must still be in private collections or with the families still. 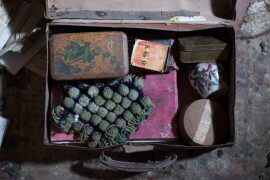 Of course, I saw some great photographs on Monday which Cyril had with him in his treasure chest of Swona memorabilia. The two black and white photographs below where my favourite finds from yesterday, especially the one of Edith Rosie feeding the sheep. The star find in the archive was an award winning essay by Cyril’s son Alexander Annal, which he must have written as a school boy. ‘Shipwrecks of Swona’ describes the key shipwrecks in Swona’s history, mostly from primary sources and stories passed down the generations. It is a very rich account and also contains a fair amount of humour, giving a taste of the importance of the spoils of the wrecks for the islanders’ survival. My favourite story involved the ‘Pennsylvania’ ship, which wrecked on 27 July 1931, on route from New York to Oslo and Copenhagen (pages 6-8). All of the crew survived thankfully, and as was always hoped by the islanders there was plenty of cargo to salvage. In this instance a customs officer was on the scene very quickly and noted the large quantity of Cornflakes boxes (enough to fill a barn). The customs officer ordered Grandad Annal to burn all of the cornflakes boxes by morning. This is Annal dutifully did, but in the darkness of night, emptied the contents into several barrels. Grandma Annal reported that over that year ‘the hens never laid better’! Hi, I’m Dr Keir Strickland, and I’m a lecturer in archaeology at the University of the Highlands and Islands Archaeology Institute, based up here under northern skies in the Orkney Isles. 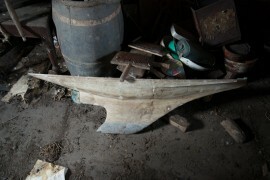 I’ve been an archaeologist for approaching 15 years now, but had been fascinated by the past since I was much younger. Fascinated by its seemingly foreign and exotic nature – in much the same way that I was fascinated by far off lands, so too I was drawn to the past. Moreover, I was drawn to the discipline of Archaeology over that of History – with the former embodying an apparently neutral physicality that seemed (to teenage me at least) to be so missing from the authored records of that same past. 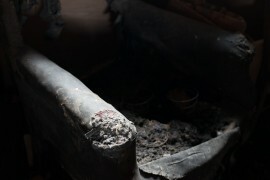 Archaeology offered a far more physically immediate gateway to the past – the opportunity to hold artefacts that had been crafted, and used, by someone else’s hands years (sometimes a few, sometimes thousands) ago, the opportunity to uncover and piece back together homes, towns, and even entire societies. This interest initially took me to South Asia, where I studied the “collapse” of civilisations (or complex societies) including the Rajarata Kingdoms of Sri Lanka – and it was this interest in the transformation of societies, and the accompanying transformation of place (with all of its associated significance, meaning, and values) into space that lead to a complementary fascination with the act and aftereffects of abandonment – the abandonment of the Scottish Highlands during the Clearances, the abandonment of northern Sri Lanka following the fall of the Rajarata Kingdoms, the ongoing urban abandonment of Detroit. The act of closing doors one final time, deciding what to take and what to leave, the decision to leave and the subsequent decisions not to return. Inherently, all archaeology deals with abandonment – the abandonment of artefacts (whether deliberate or accidental), the abandonment of places – archaeological sites are de facto abandoned places. 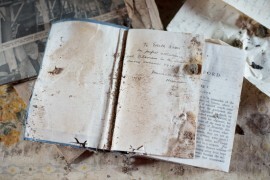 Within artefact studies there has been, in the past decade or two, far greater attention paid to the abandonment of artefacts – to structured deposition. 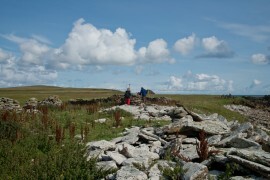 However, within landscape and settlement studies it is relatively rare that we, as archaeologists, specifically study the actual act of abandonment – the interest is always in reconstructing the fluorescence, the occupation and function of a structure, the development of a landscape – and the final abandonment and collapse is often almost seen as akin to a veil that needs to be removed to better reveal the events that preceded them. Instead, I want to examine that veil – to examine the act of abandonment, the transformation of place to space, and the ways in which we (as archaeologists) define abandonment – how we temporospatially bound abandonment , and how we present that to our peers and to the wider public. And it is that which I will return in part two of this blog post.